Another year, another roster line up, graphical improvements, yes it's the perennial release of another EA Sports title, this time being Soccer on XBox. 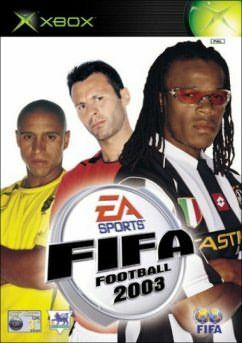 Each year the FIFA series brings something new to the table, whether it be in new techniques programmed into the gameplay or some other feature, it always delivers. I think this is possibly due to the fact that with America, the FIFA series has some catching up to do on the Madden NFL franchise that can now pretty much rest on it's laurels, being a quality game in it's own right. 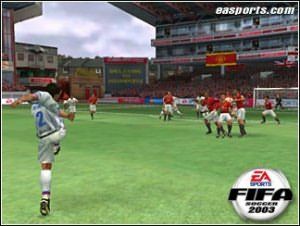 As always with the EA sports line up, FIFA 2003 bring to players the new season's player rosters and complete line up for both international teams and club sides. Graphics are superb with animations being smooth and players actually looking pretty much like their real life counterparts. EA Canada have taken advantage of the power of the XBox to produce a high res game that looks wonderful and doesn't seem to suffer too much from any frame problems which have been a bug bear with some XBox games of late. Grass and players have excellent texture work done and stadiums are very accurately presented. Some innovations for this years version are present with heavy use of the right stick coming into play as far as ball control is concerned. Adjusting the degree to which the stick is pushed determines to the severity of the kick taken by the player onscreen. The sprint function on the game has also been tweaked enabling you to tap ahead with the right stick whilst using the turbo mode to sprint ahead. The right stick is also used to do a number of fancy combinations of footwork within the game itself. This is extremely fiddly and I found for the most part that I had trouble executing some of the more elaborate commands for control of the soccer ball. This was especially troublesome considering the standard camera angle of the game which does not really illustrate which foot the ball is being dribbled or kicked with. There are numerous game modes available to players including Club Championships which pitch the European teams against themselves, Seasonal matches and the every popular friendly game which is always anything but friendly. Adding to the realism in the game is the sheer detail added to all the stadiums with crowd animations and also ambient stadium sounds. It seemed to me that the recordings used in the game are of a much higher standard than those I have experienced in earlier incarnations of the game, though it must be said that previously I have played the series on PSOne and PS2. Add to the general atmosphere given by the crowd and then sprinkle in some of the best in game commentary you could hope for and audio is a blast to listen to. The commentary is accurate, and concise, giving players a true indication of how their game is actually going. You might find though during multiplayer mayhem that you want to turn off the commentary in order to sprinkle some of your own in, whilst giving your friend's a drubbing. Another nice touch is the attention to making players identifiable by appearance alone. Most of your superstars sport the features that they do in real life and look very very good. All sponsor patches are included on uniforms as well. Players have been given different heights as per their statistics and for the soccer nuts out there, there is a fair bit of information on the teams as well. In Single Player mode, you will be very happy to note that the game's AI is quite canny and should pose quite the challenge for discerning gamers. I personally love the thrill of having a few mates over and going head to head in some insane four player action. It's this sort of thing that will guarantee that FIFA will be played on your machine right up until the next instalment is out.